Embracing the continued evolution of German combat engineering! 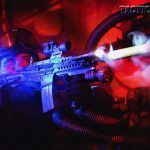 Used by select Special Ops groups, Heckler & Koch’s formidable gas piston HK416 in 5.56mm just may become the next generation of U.S. battle rifle. 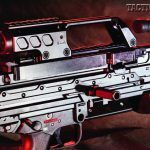 HK’s MG4 Light Machine Gun features improved optics capability, ambidextrous safeties, and a quick-change system that allows one soldier to change barrels even when they are hot. A heavy-duty carry handle helps haul this one-man, 17-pound fighting machine. The MG4 feeds 5.56mm ammo from either magazines or disintegrating belt links, making it a versatile gun with a lot of capacity. Rising from the ashes of post-war Germany, arms manufacturer Heckler & Koch took a late World War II assault rifle design that had been developed by a Spanish armory and made the first successful German assault rifle—the select-fire G3. 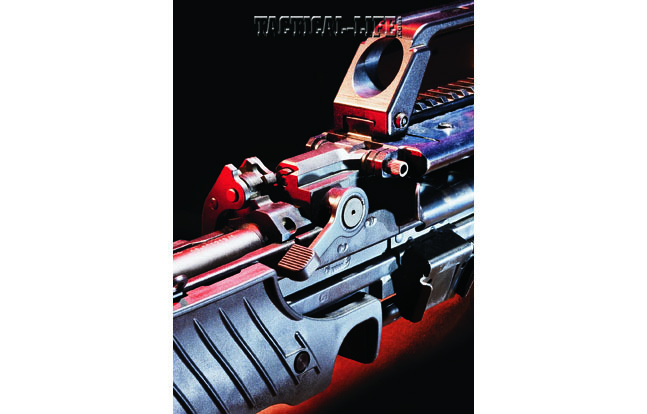 The key to the G3, best known to U.S. shooters in its civilian semi-auto form as the HK91, was the innovative “roller-delayed blowback” action, which had been developed near the end of the war for the German Army’s StG 45. 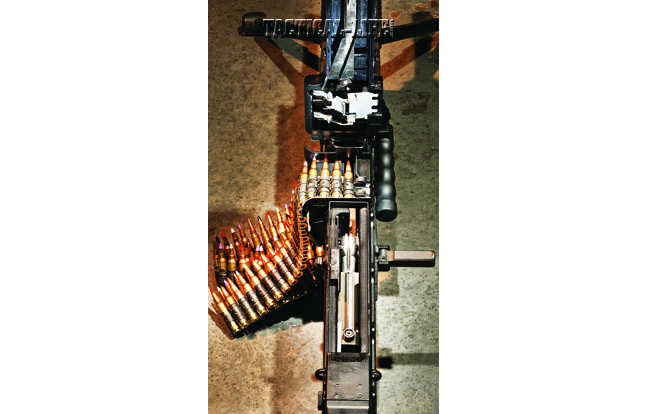 It was a new concept, the “assault rifle,” which fired a round with more power than a submachine gun but less than a full-size rifle cartridge. With a 30-round magazine and pistol grip, it was a radical departure from the Mauser 98 rifles. Perfected too late to be used in any great number before Germany’s surrender to Allied forces on May 8, 1945, the StG 45’s designer, Ludwig Vorgrimler, a Mauser factory engineer, took the assault weapon design to the Spanish Army, where it went into production as the CETME Model B. The CETME B, like the StG 45, was a marvel of modern mass production methods. The receiver and many parts were stamped out of sheet metal, eliminating many of the expensive hand-fitting steps required for other military weapons of the period, and plastic and wood handguards and buttstocks were held in place by easily removable pins. But it was the roller-delayed blowback action that made the design unique. 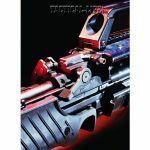 Unlike most of today’s black guns that use gas from the cartridge fed back via a tube to cycle the action, the CETME’s bolt (and the G3’s) is operated by the recoil of the fired shell blowing back the bolt, which is “delayed” by rollers that lock into the sides of the receiver until the bullet leaves the barrel and the drop in pressure allows the bolt to travel back freely. In 1957, when the West German Army set out to select a rifle chambered for the NATO standard 7.62x51mm round, their first choice was the Belgian FN FAL rifle, which had been adopted by England and many of the NATO members, but the still-financially-strapped country couldn’t afford to buy the license to produce the gun in Germany. They quickly set their sights on the CETME, and Heckler & Koch was awarded the contract to produce the rifle, now renamed the Gewehr-3, the G3. 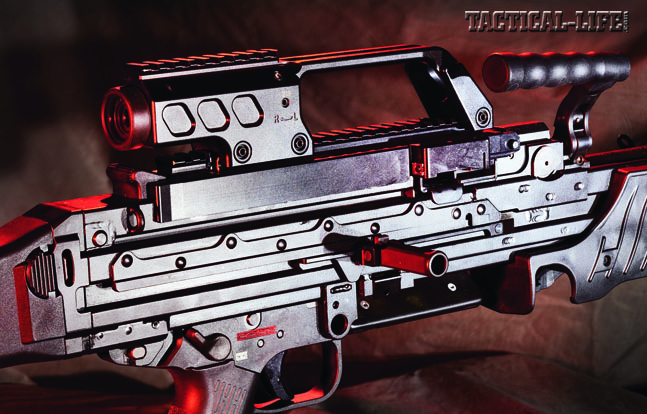 So, ironically, the original German battle rifle design came home via a Spanish company. The 7.62mm NATO G3 (and its civilian counterpart, the HK91) quickly became one of the most recognizable long arms on the 1980s world stage, and when NATO switched to the 5.56mm round, it was adapted to the smaller round as the G33 (the civilian version became the HK93), as well as belt-fed and sniper rifle variations like HK21 and the famed PSG1. While these two rifles and their full-size offspring were issued to soldiers in over 50 countries, it was their “little brother,” the MP5 9mm submachine gun, that rose to the top as the most successful weapon in the German manufacturer’s lineup. The 9mm submachine gun came into its own to combat the widespread incidents of terrorism of the 1960s. 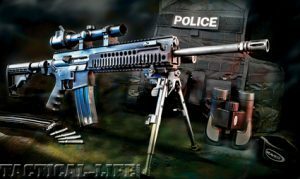 Police, as well as military units, began looking for a small, high-capacity, controllable weapon for use in close-contact scenarios like onboard hijacked airplanes and in urban hostage situations. Since, like the G3 and G33 rifles, the guide rod and springs that return the bolt to battery travel within the bolt, the design of the MP5 allowed for a folding stock (MP5A3) or no stock at all (MP5K). Law enforcement and military tactical operators quickly fell in love with the MP5’s handling, accuracy, and its 33-round magazine. Since its release in 1966, embassy guards and Secret Service agents, state and local governments, and armies have adopted it across the globe. Its appearance in countless newspapers and TV broadcasts, as well as Hollywood action movies, has made the HK MP5’s silhouette so familiar that is instantly recognized as the submachine gun. But Heckler & Koch was not going to rest on its 35-year-old laurels. 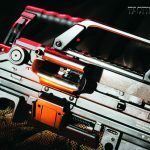 Back in the 1990s, they began developing replacements for the G3 military rifles and MP submachine guns, and while the latest versions, the 5.56mm NATO G36 assault rifle and HK MP7A1, have made names for themselves, the HK MG4 and HK416 have become more famous on the battlefield. 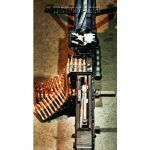 The MG4 is a belt-fed machine gun that one man can carry and operate with an 885-rpm rate of fire. The HK416 is an upper receiver assembly that replaces the direct impingement (DI) gas operating system of the standard M16-style rifle with a short-stroke gas piston. 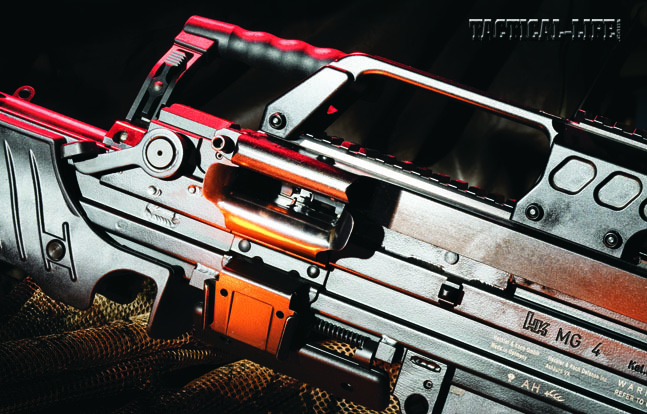 The traditional DI gas system bleeds gas from a port in the barrel, which travels back into the receiver and blows hot gasses and fouling into the rifle’s action, increasing the possibility of malfunctions. The HK416, and its 7.62mm NATO chambered big brother, the HK417, use gas from the barrel to move a piston that transfers the impact to the bolt and vents excess gas out of the handguards. That keeps the rifle’s action cooler and cleaner. In hostile environments and high-volume firing situations, the installation of an HK416 upper can extend the life of the M16-styled rifle—and its user! 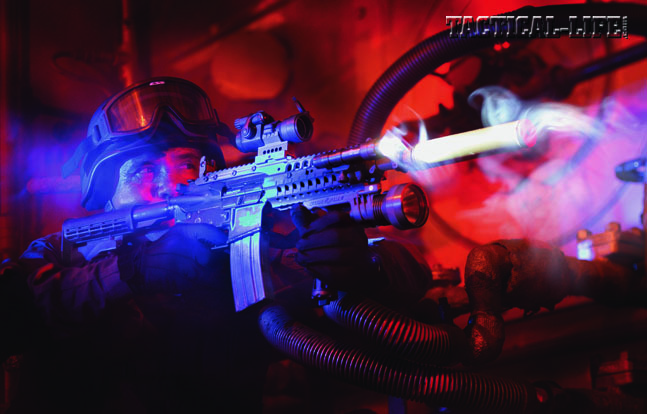 Fans of black guns will be happy to know the current Heckler & Koch catalog features the MR556 and MR762—civilian semi-auto, complete rifle versions of the HK416 and HK417—as well as the G36-based SL8-6 5.56mm rifle, and the latest evolution of the MP5, the .45 ACP chambered USC. Check your local laws to see which rifles are legal for your state.